I didn't always love artichokes. It was some time around the "spinach and artichoke dip" craze of the late nineties that I realized that I actually did like artichokes. Now I'll eat them on just about anything... salad, pizza, sandwich. Earlier this week I was looking for some new sides to have with my meals that would be keto-friendy. I saw that artichokes were relatively low in carbs so thought it might be good to make some sort of casserole out of them. 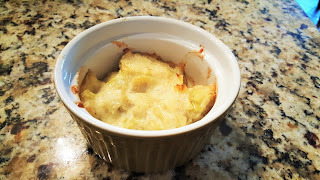 Since I am on the only one in my household who eats keto or would eat an artichoke for that manner, I just made small ramekin size servings. I didn't find a recipe, I just kind of made it up as I went along and overall not too bad. Open artichokes and drain well. Put artichokes in bowl and use fork to mush them up a bit. Add remaining ingredients and mix well. Put in individual servings or one small casserole dish. Sprinkle with additional Parmesan Cheese. Bake at 400 degrees for 8 minutes. Turn on the broiler and let broil until top is crisped to your liking. Kawaiian Island Featured on Super Cute Kawaii!